Last week I wrote about the changes we are planning for our little piece of the Earth, but I failed to mention the rationale for such a change. We understand that we cannot make a huge impact on the whole mess of global warming, environmental distress, or any of the other many problems that face Mother Earth, but we believe, as individuals and as a couple, we can do our little part. Through these changes, we hope to make our small contribution to improving the environment. Aside from the damage I was doing to our pastures by spraying herbicides, spreading fertilizer, harvesting hay, and burning a lot of fossil fuel, which I discontinued many years ago, there is another, underlying rationale for the changes we propose. We are at a point in our lives where certain tasks are becoming more and more difficult. It is not that we are getting old, we are getting smart, and selective. For instance, when an animal dies on our property, we grieve, we celebrate their life, but we don’t replace them. In most cases, we couldn’t replace them if we tried. They each have very unique personalities. We currently have nineteen animals grazing our pastures. For the most part, these animals are getting to the limit of their expected life span. Certainly, the animals living at Song & Dance are well cared for, and most live well past their prime. We like that, but we also realize they will all be gone someday. 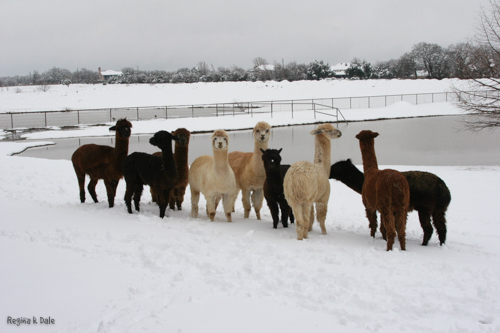 Our largest group of animals is our alpacas. We have eight. The life expectancy for alpacas is 15 – 20 years. At the present time, they range in age from 10 – 17 years old. As you can see, they are creeping up on that time. Without their protection from coyotes, every other small animal’s life span on our property may decrease. The next group is the horses. 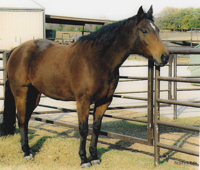 Two quarter horses and one miniature horse have an estimated life span of 25 – 30 years. That seems like a long time, until you realize that their ages are 20, 25, and 26. Oops! How time flies. We have two angora goats that are both on the outside of their expected life span of 9 – 11 years. One is 11 and the other is 14. They both seem healthy now, so don’t count them out just yet. The four Southdown Babydoll sheep and the two miniature donkeys will most likely outlive them all. 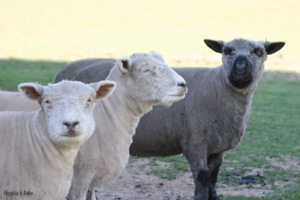 The average life span for a Babydoll sheep is 15 – 16 years. Right now, they are 5 and six years old, but a couple of them are already suffering from arthritis. 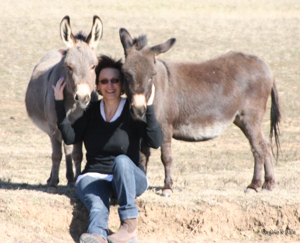 The miniature donkeys are expected to live to between 25 and 30 years. They are currently 10 and 6 (mother and daughter), and if loving has anything to do with it, they have a long way to go. I realize that all this talk about age and mortality may seem a bit morbid, but planning ahead has its benefits. It was interesting for me to put all this in perspective. By the time we have no more grazing animals, our entire property will be eco-friendly, and we will be happy to sit on our porch and watch the wildflowers, butterflies, bees, birds, and dragonflies do their thing, and be thankful that we don’t have to feed, shear, trim nails or treat ailments. 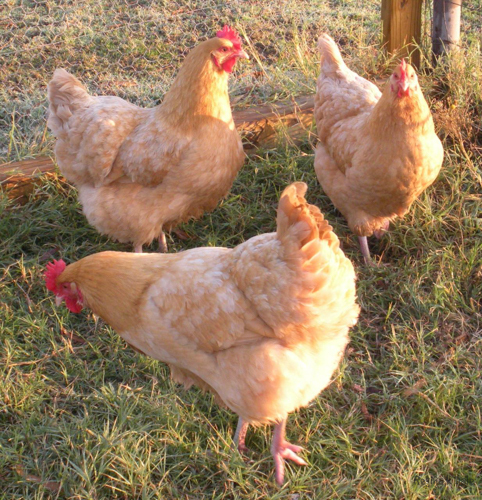 We will miss all of the animals who have graced our property through the years, but, at least, we will still have our chickens. 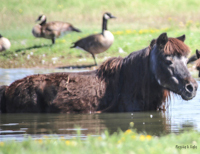 This entry was posted in aging, Animals, Change and tagged age, alpacas, Angora goats Babydoll sheep, chickens, donkeys, environment, horses. Bookmark the permalink. Thank you for introducing us to your family! They are lovely and seem very, very happy. More pictures in a future post? We love them all dearly. It is difficult when we lose one. WOW! Loving your menagerie of animals and your thoughtful dialogue. What a wonderful spot the two of you inhabit with your animals and what a meaningful change you are making, at what seems like the perfect time. Recently, more than ever, I’ve had to face the realities of my years, 74, and to think about how to adjust my life accordingly. I can no longer do as quickly and easily without fear of injury many of the things I used to enjoy doing; and I can see the time approaching when I will want to gaze as “wildflowers, butterflies, bees, birds, and dragonflies do their thing.” Congratulations on taking charge of how you want to age. You will get no sympathy from me about aging, only understanding. I used to be Superman when I was in my 30’s and 40’s. Now, at 75, I am more like Mr. White. You must know I applaud your direction, dedication and stalwart stand on that which is at the core of beliefs. Thanks again for the bear … it was missed. Thanks for your comment, and for being my brother.